You made a claim that you cant substantiate. I'm not going to accuse you of making silly statements without having quotes to back what I'm saying. As I said before, you won't be able to quote me on anything I've said that's asinine. In the future when addressing me, if you make any such claims be prepared to back it with something. My claim is backed by the previous pages. No need to hand out the spark notes IMO. No your claim isn't backed by anything.. You say I said some things that were "asinine" which is a lie basically. I'm just saying in the future have some quotes to support what you're saying. This is what happens with recreational life. which player is being discussed? I've been a Jaylen Brown fan since his high school days. But I still believe Ingram has the higher ceiling. His length makes him a factor offensively, defensively, and on the boards. Specifically, when talking about Ingram's offense. He gets to the free throw line with high volume and high efficiency. Out of all the wings in the league who get 3 or more FTA per game, Ingram's top 10 in free throw rate (number of FTA per FGA). http://bkref.com/tiny/pnLrp . Other guys on that top 10 list include Butler, Greek Freak, Derozan, RHJ, Jeff Green. And there are a ton of stars on that list (below Ingram). But while Ingram has become addicted to beating his man off the dribble and scoring or creating. Jaylen has worked on fitting in on a team level. Jaylen is the superior player off ball. Jaylen doesn't turn into wallpaper for long stretches of the game if he isn't a primary initiator. And some of that is Boston's offense making sure everyone touches the ball on possessions. I think Luke is competitive. And I'm sure this Boston success doesn't sit well with him. He'll want to prove he can develop Ingram into a leader who wins. Ingram's development has that going for it. I feel actually ashamed that I was a part of it..
best to make your point, go back and forth once or twice at most and then move on. I don't mind a little disagreement and back and forth but once it has gone downhill I don't really care all that much on the outcome. Nothing any numskull says is going to enlighten me and I know they are incapable of seeing the truth so what is the point?!? Say what you mean and mean what you say and let it go. Couldn't agree more, as of late I've been doing just that.. Slipped up. I can't see the link from where I work, but I only imagine it's Grant Hill's special 'little hop step to advance, then either 1) step through drive if defender don't react or 2) cross over if defender reacts'. 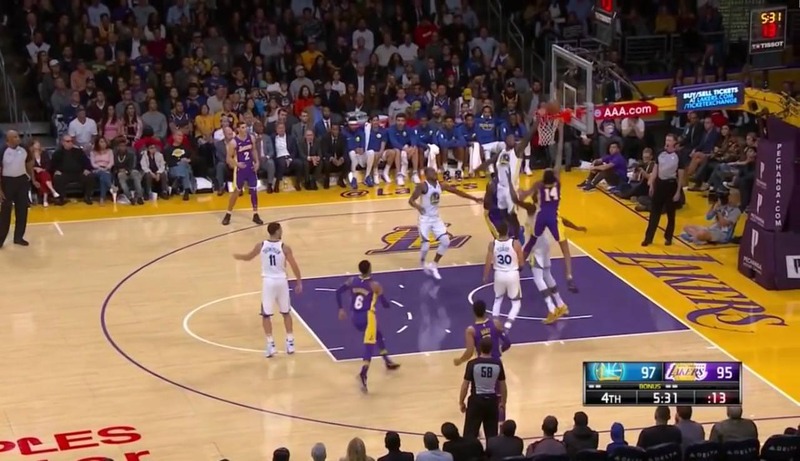 BI uses that move a lot to gain an angle to drive past his defender, but I rarely saw him successfully utilizes that second part of the move. Left hand ball handling needs to be worked on to the point he can consistently explode after right to left cross over. Yep it's that hop step or "hang-dribble" it's commonly called by trainers today.. the hand that's doing the crossing is the one that requires most ball handling skill, as long as the receiving hand only has to do 1 or two dribbles and gather, those are usually straight ahead simple dribbles. hmm. I guess you can call it a hang-dribble. Like I said I can't see your link, so we could be talking two different moves here lol. The first move on this highlight is what I am thinking. This guy is calling it thru the leg hesitation and there is a "hang dribble" component on the move as well. 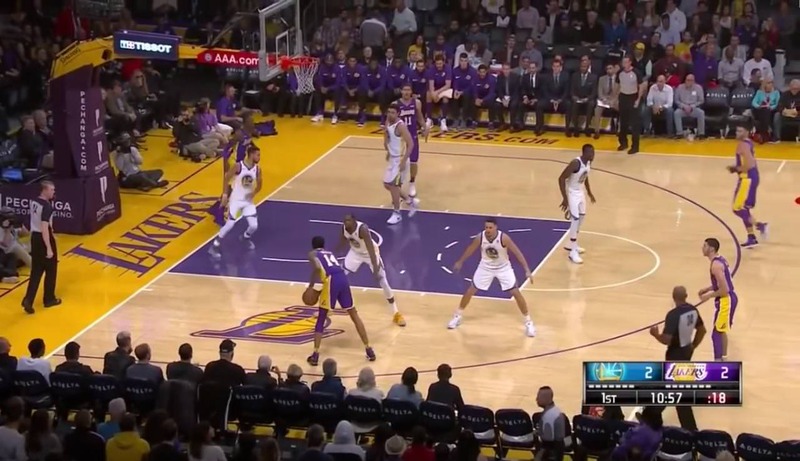 I just thought the most important part of the move was a subtle hop step/gather step/forward step... which actually creates an angle to drive if defender doesn't commit or set up for cross over if defender does commit. BI actually does this quite a bit to gain an advantage to go right, but his cross is more right to left with meh explosion instead of quick to left and explode forward like GH. You see a lot of other players using it going straight successfully including BI but not many could use the counter with cross over consistently as GH, KD and few. It's funny you actually saw the grant hill comparison. I was watching some old Grant videos a month or two ago and thought about how their games have some similarities but thought against even mentioning. Keep it to myself for the chastising it could get depending on what week it is and how the posters feel that particular week. I'm excited to see BI's progression in year 3. Good stuff, as always.. On the post entry passing it seems there aren't that many guys that do it well anymore. Could be attributed to everyone wanting to jack up threes now. He definitely needs to improve there though. Especially with a monster like Randle on the block. That last possession where Ingram gets the steal from Durant makes me so (bleep) excited about his defensive potential. He showed serious defensive potential in all areas as a skinny 20 year old, you might have missed it because your brain didn't direct your attention that way. Is it weird that I don't think that's his best game? I loved the stuff from the late 3rd quarter and on. Really loved the change of pace on Zaza in the 1st half, but super lazy closeouts by Durant early. Durant, Draymond, Bell, Thompson, Next... ? Especially loved how he lowered his shoulder and shortened his dribble on a change of pace dribble at 3:47. Got by Klay. I mean, he lost half his height and the ball-height was lower than the knee. Thompson couldn't do anything on that. 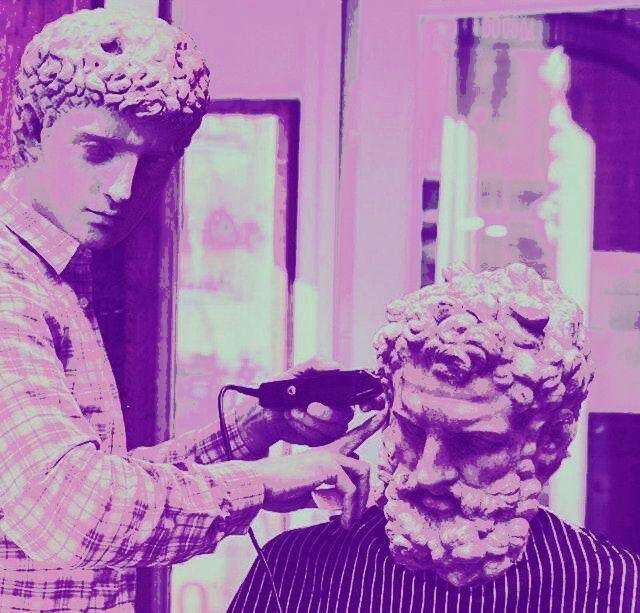 If you're listening. I too subscribe to your dream of one day having Ingram at the 1 and Ball at the 2. 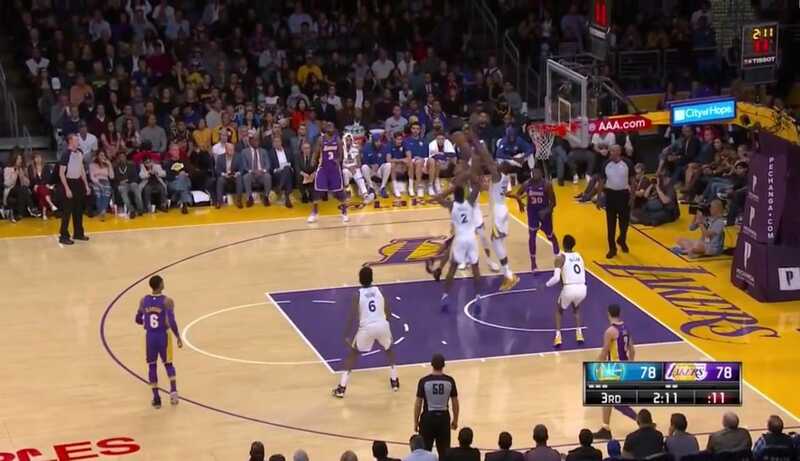 Ingram would have to playmake in the vicinity of a Draymond Green, and Ball's shooting and cutting to the basket would have to translate from the college version of himself, but I still hold out hope!!! Is there a "Sixth Sense" plot twist in the works? 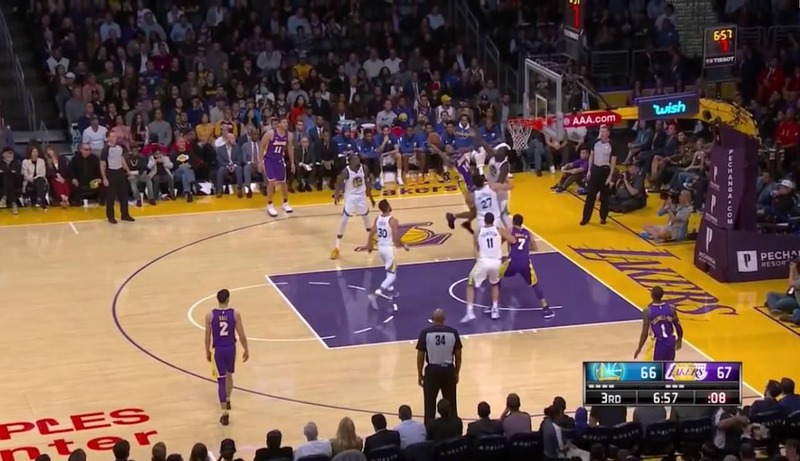 Is Luke actually grooming BI, not Randle to be the Draymond type facilitator on our team? We'll find out I guess. 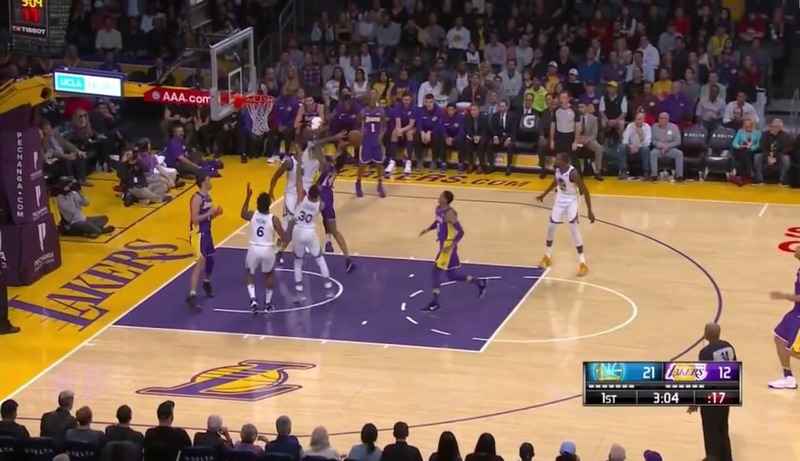 I tweeted those pictures to Joey Ramirez and he mentioned Luke making it clear to Ingram that defenses were overcommitting to him this way and leaving shooters wide open. I think it's one of the reasons BI thrived at the point forward position later on. 2) When he doesn't telegraph or preordain his moves, I don't think defenses can neutralize him. He has the drive game to force numerous defenders to collapse on him, but needs to establish a more fluid outside/perimeter game to get defenders away from the paint area. 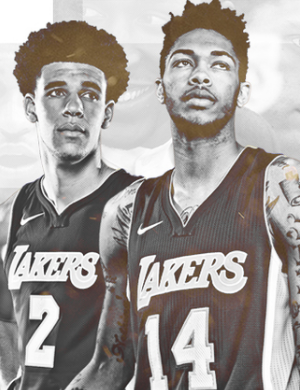 3) Luke talked about angry Ingram being on a different level, so I think much of the above has to do with his mentality and confidence level. When he lets the game come to him, it's beautiful. When he doesn't, defenses know what he's going to do and how he's going to do it.